Women who are struggling with infertility are always researching and looking for information that will lift the mystery behind their infertility, and anyone who’s looked will know that it isn’t difficult to find information. The only problem is that you can get snowballed by it and will find it difficult to shovel yourself out of it all. That’s the Internet era for you. This is something the 21st century has brought to us, just as it has brought us fast lives and workplaces that operate 24/7, 365 days a year. What isn’t so tangible is that it has also brought with it the growing problem of infertility and in many ways its linked to our lifestyles - food we eat or don’t eat; the fact that most people refuse to recognize that something called exercise exists ; and that there is no light at night, because that’s when human beings were typically meant to sleep, are all becoming factors that affect fertility. Today, most young people don’t manage to get their 8 hours of beauty sleep. If you don’t get at least 7-8 hours of sleep at night, it will affect your mood, health, hormones - and your fertility. And today, IVF specialists everywhere are starting to sit up and take notice of this fact. While we are catching our 40 winks, our bodies are going through the motions of repairing cells as well as regulating hormones. Leptin is the special hormone that is the main link between sleep and fertility. It affects ovulation and it’s important that women get adequate sleep to ensure proper leptin production. Lack of sleep also affects the production of hormones such as estrogen, progesterone, follicle-stimulating hormone (FSH) & luteinizing hormone (LH) all of which are connected to fertility in one way or the other. Any compromise on the production of these hormones can impact fertility in women. With so many women working extended hours and on the night shift (which is infamously known as the “infertility shift”), insomnia is becoming another major factor that impacts women- it affects your hormones and can also age you faster than you normally would. 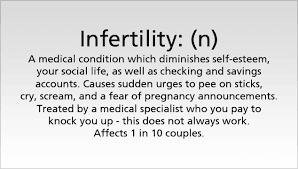 While the stress-infertility link is a widely debated one, the fact is that when women are diagnosed with infertility, it creates a tremendous amount of stress which has a further negative impact on sleep, mood and fertility, thus setting up a negative vicious cycle. When stress takes on a chronic form, it can impact sleep habits which in turn can worsen depression and anxiety. If you work nights, there is a distinct possibility that you will have a much tougher time getting pregnant. A number of studies have shown that women who work on night shifts have irregular menstrual cycles which can affect conception. This is because our bodies function on an internal clock- The Circadian Rhythm. Standard patterns of light & dark ensure that our Circadian Rhythm continues to function normally. However working nights can send your Circadian Rhythm for a toss. It also controls the production of cortisol (stress hormone) and melatonin (the sleep hormone). When you keep all these facts in view, it’s not difficult to understand why and how lack of sleep can impact fertility. Very simply, if you work on the “infertility shift”, and are trying to have baby, first make a shift to a routine that will give you sufficient amount of sleep, at the right time. Though this may be easier said than done, it’s a very important aspect that women who desire to have a baby, should not overlook or ignore. Be kind to your body and you will find that it reacts in a better way too.